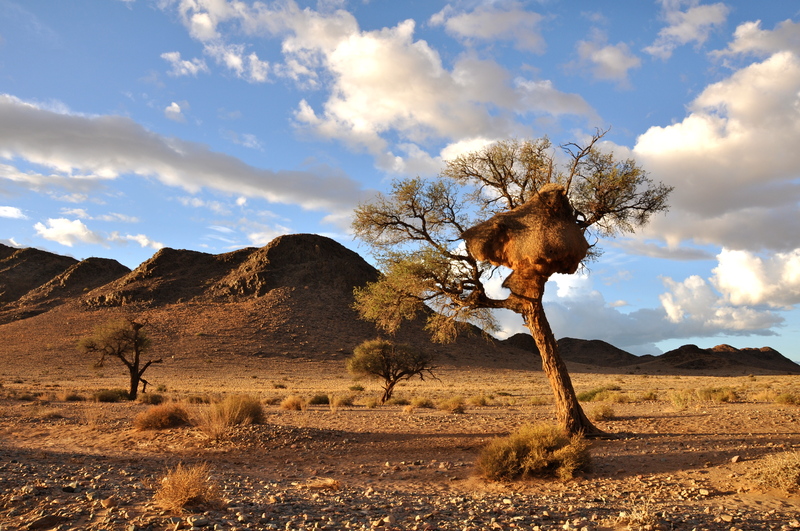 This past week, we travelled south to our neighboring country of Namibia. The first leg of the trip took us to the largest city, Windhoek, where we spent the night at a lovely B&B called the Olive Grove Guest House. 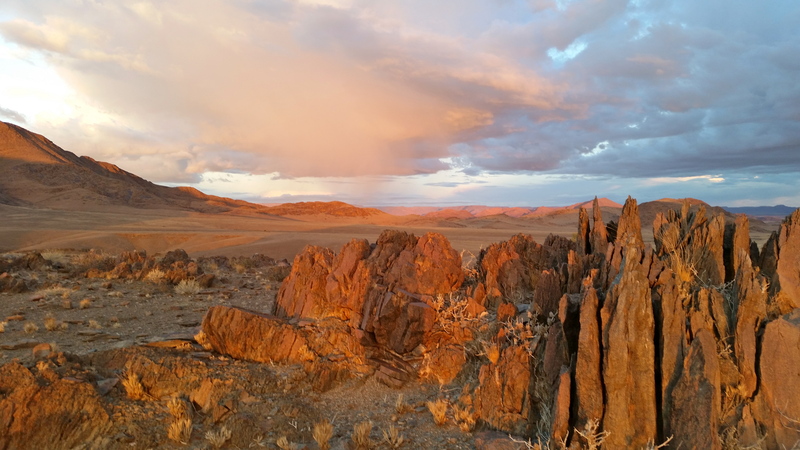 The next morning, we caught a hopper flight to the Sussusvlei area of the Namib Desert, which is located about an hour south of the city. When I say a hopper flight, what I really mean is that we flew there in a wind-up toy. Truly, I have never been in a smaller plane. It was a four seater – including the pilot. Looking back at the photos, I am amazed that I crawled into the back seat and strapped myself in without being sedated first. Take a look at the photo. Would you get into this thing? 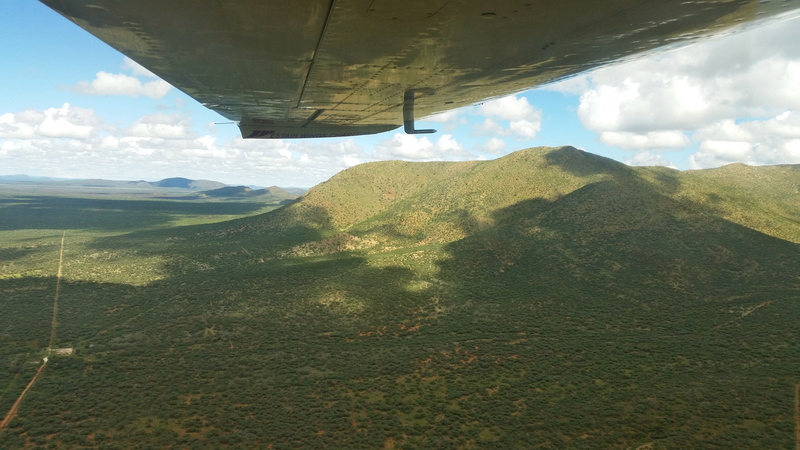 Thankfully, our pilot seemed very competent and professional, and had been flying in the area long enough to know the peculiarities of flying over desert thermals. He was young (no danger of heart attacks) and jovial (no anger management issues) and Scottish (just all around good folks). Once I got over the initial shock of flying in a tin can – and not exactly a shiny new one at that – I relaxed and prepared to enjoy the flight. 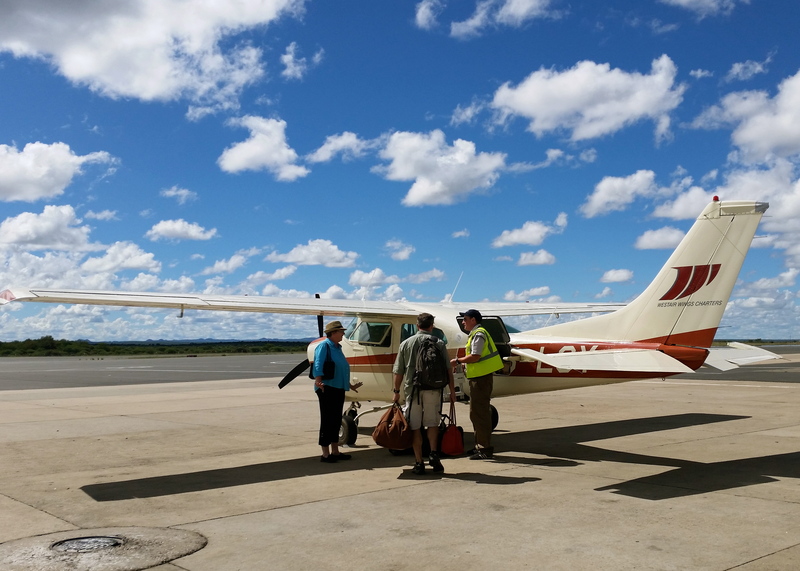 We had been given a baggage limit of twenty kilograms per person, and the pilot stuck firm to that number – with good reason. With only three small duffel bags, there was not an inch to spare in the tiny cargo hold! The third passenger was a lovely lady of about sixty-five who hailed from San Antonio, Texas – of all places. 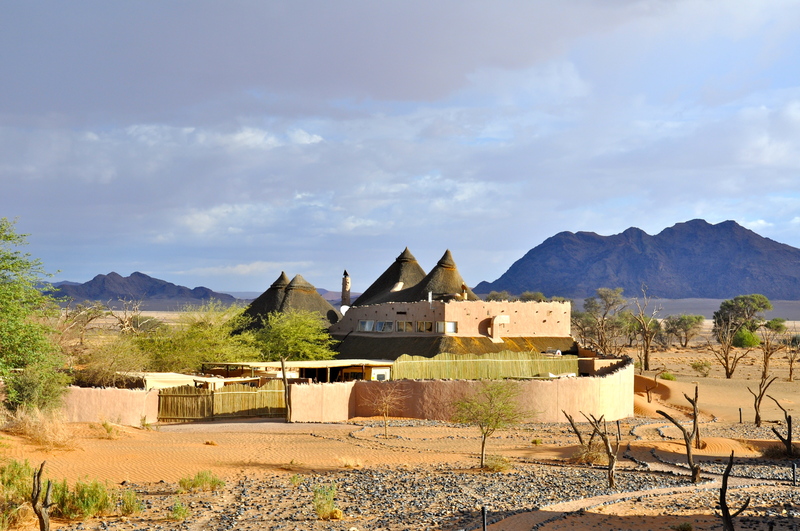 Her retirement gift to herself had been a several months long vacation across Africa. Surprisingly, she had traveled much of it by boarding cargo ships – something we did not even know was possible. Imagine spending weeks on the open ocean with only the ship’s officers and a mostly Filipino crew as your companions. She had nothing but good things to say about her cabins on the various vessels she had boarded, and seemed outgoing enough to make friends in any situation. I’m sure she saved a few pennies by traveling this way – and made some amazing memories as well. By the way, her bag was smaller than either of ours and she had been traveling for three months. As I have mentioned in previous blogs, packing light is something neither of us have mastered! 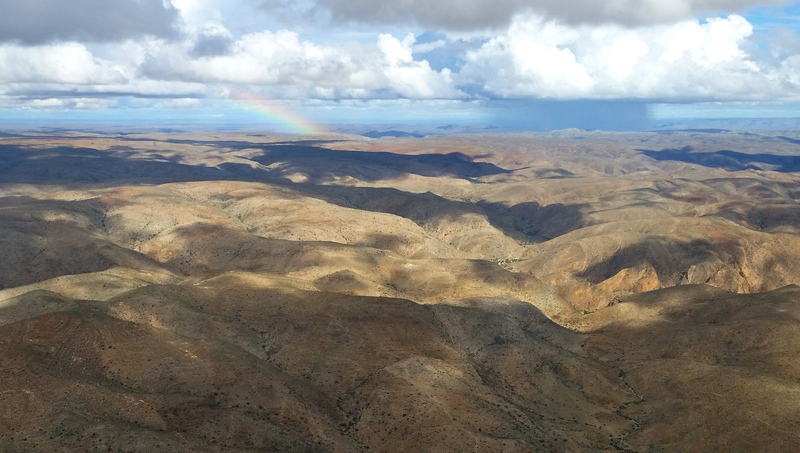 The flight turned out to be great fun, as we flew very low and close to mountains, all the while skirting the scattered thunderstorms. The area was unusually green due to some recent rainfall. 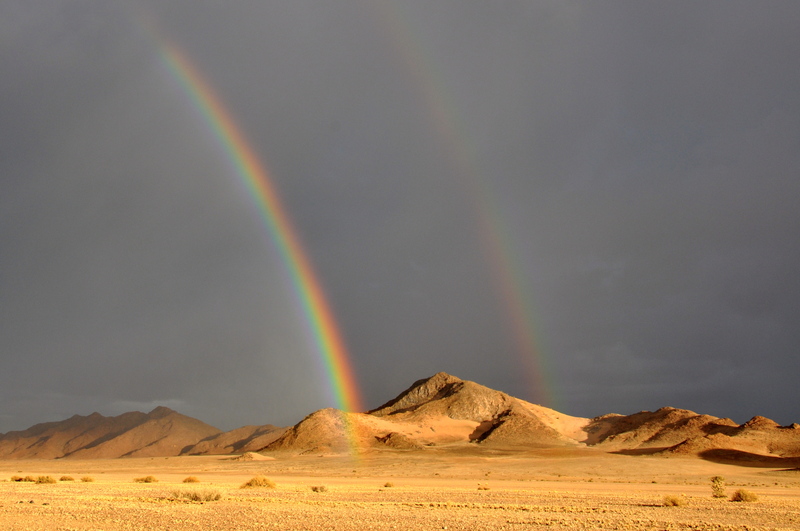 Nearby thunderstorms mean rainbows, too! A few little bumps along the way weren’t enough to rattle us, and the beautiful scenery was our own in-flight entertainment. The landing was perfect, and a jeep was waiting when we arrived to take us to our lodge, the Little Kulala. 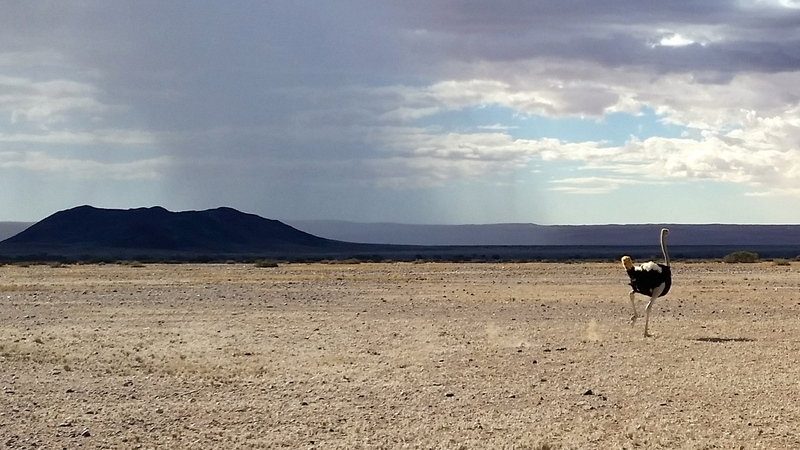 A short drive across the stunning desert landscape provided our first game sighting, when an ostrich ran across the road right in front of the jeep. That ostrich was speeding along, kicking up dust in the process. I’m not sure our jeep could have out run him! Just an ostrich in a big hurry to get somewhere! 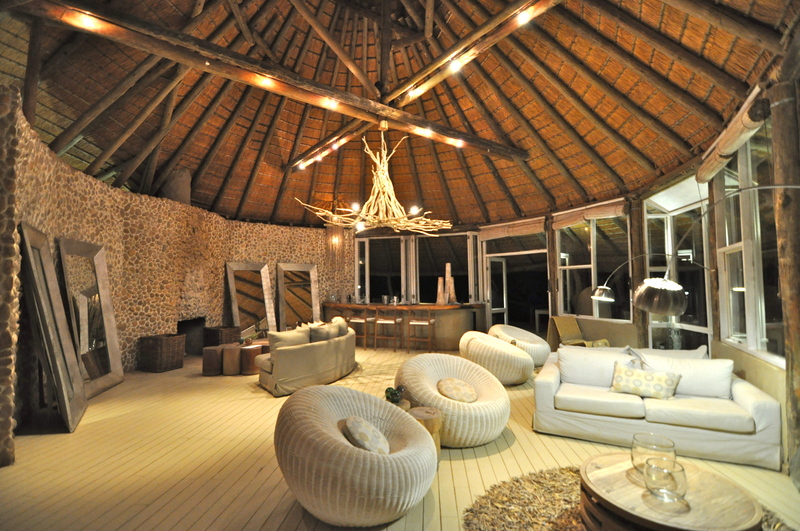 Little Kulala Lodge. A lovely setting, friendly staff and wonderful food! 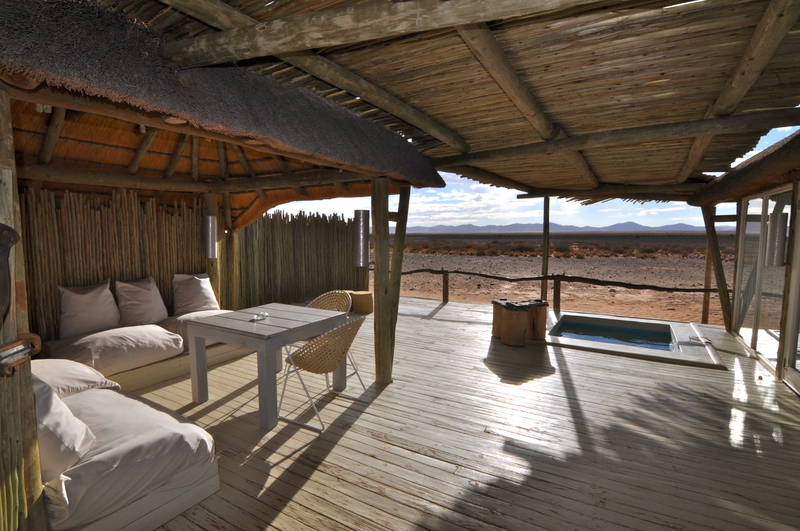 Our private patio with a great view of passing springboks, ostriches, and oryx – and an ice-cold plunge pool! 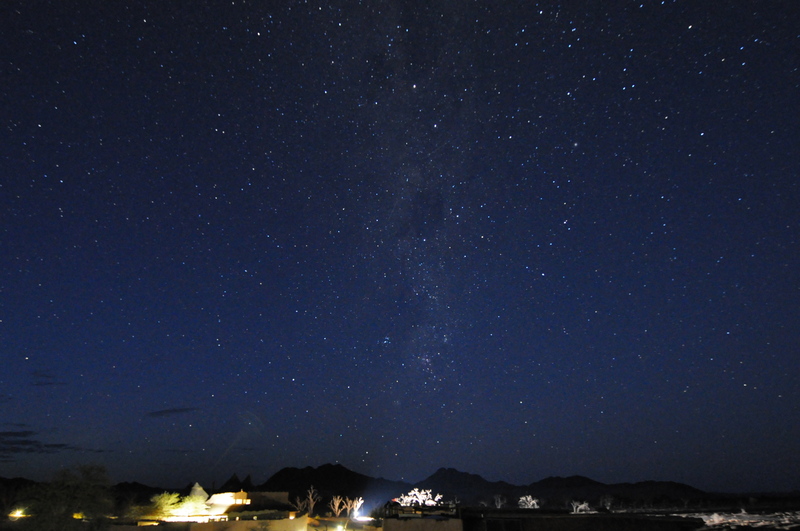 View from the top of our bungalow, which featured a “star-bed” where one can literally sleep under the stars. Now, this is the place to write a blog! No writer’s block here! They served up a lovely afternoon tea and then we headed out with our guide Simon for a private sundowner. 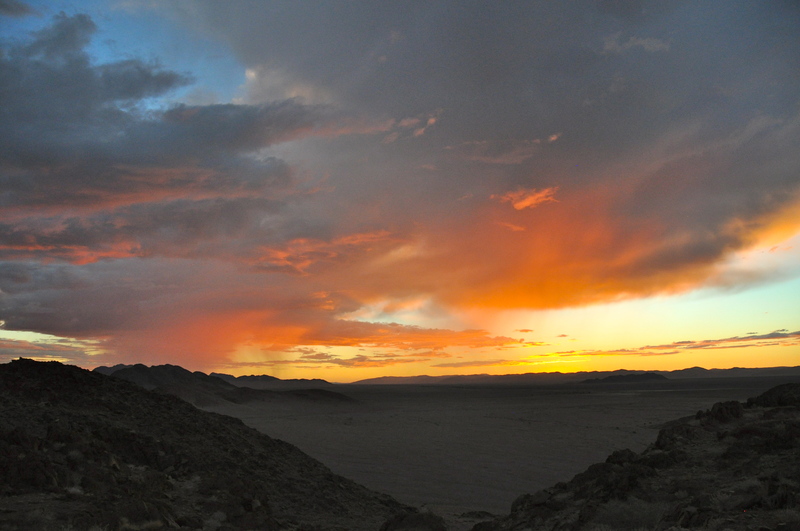 The rain stayed in the distance and provided for another gorgeous rainbow and a beautiful sunset. Incredibly vivid rainbow, which was visible all the way to the ground. Can you spy the pot ‘o gold? A Sociable Weaver’s nest. These little birds build very complicated nests that can house eighty or more birds. Simon found the perfect spot for us to enjoy our sundowner drinks. Not another sole in sight! 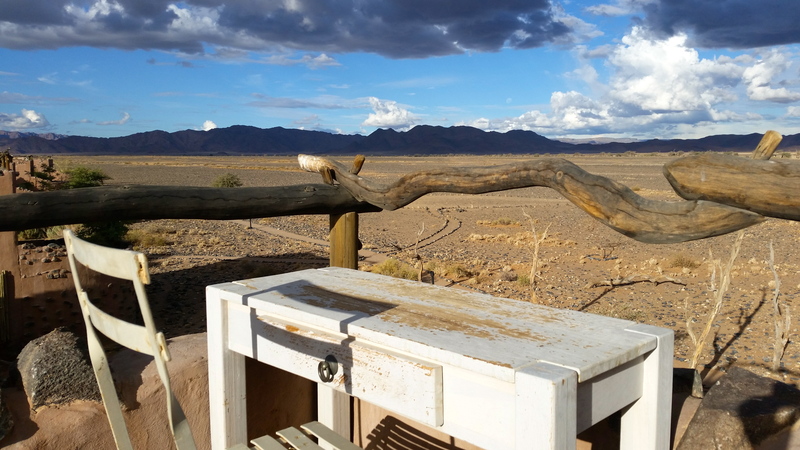 After a delicious dinner, and a few animal sightings around the lighted watering hole just beyond the open-air dining area, we headed back to the bungalow, intent on sleeping under the stars. We were surprised to find a nearly full moon made for a too-bright setting. It was a bit like sleeping with a flashlight shining in your face, so reluctantly we gave up and headed inside. Hubby had purchased a special lens to take some star photos, but the bright moon nixed that as well. Undeterred, we set the alarm for 4:00 am in order to catch a few shots after the moon went down and before the sun came up. We awoke to find the moon was still up, but managed to get a few shots anyway. 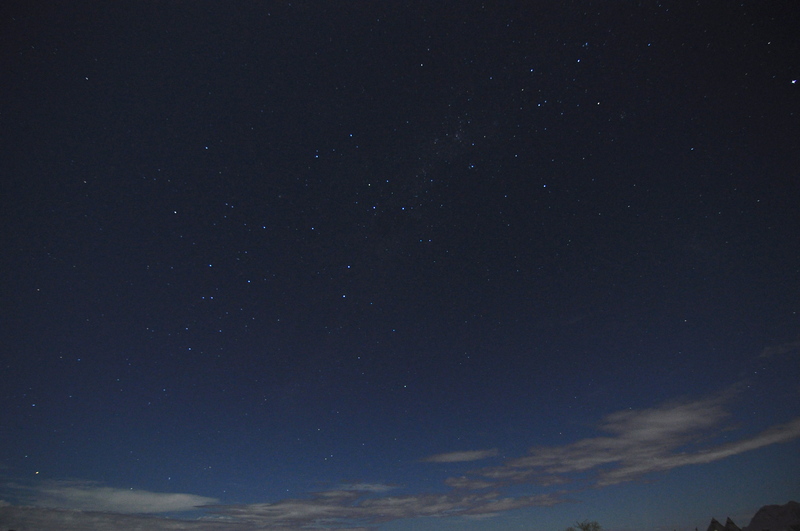 The Southern Cross. Click on the image to enlarge. 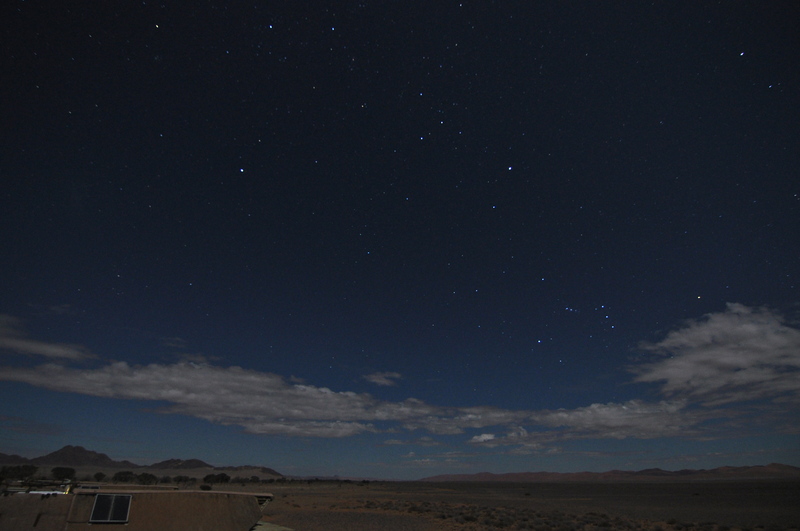 Orion as seen just before sunrise. We had a big day ahead of us, so there was no going back to sleep after taking photos. A hot-air ballon ride was planned for sunrise – if the weather cooperated, which it often did not.